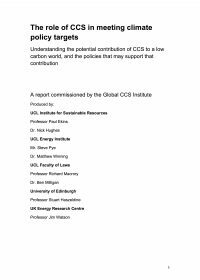 2Co Energy Limited has written this report to share its real-life CCS business case for its CCS project in the UK, the Don Valley Power Project (DVPP) This report aims to provide practical information that can be of use to others as they develop their own business cases for CCS around the world. A brief overview of 2Co and its CCS project in the UK, DVPP. A summary of existing business case-related knowledge products previously published for the Institute by other CCS projects, summarising the factors of most importance to their business cases. A description of the market and regulatory context for CCS faced by DVPP and other projects in the UK. A discussion of the financing challenge that 2Co faces and the resulting financing strategy. The resulting business plan, including revenue and cost profiles, sensitivities and prospects for future cost reduction. A description of the key risks to the project and mitigation plans. 2Co 에너지 사는 영국에서 이루어지고 있는 Don Valley Power Plant 프로젝트(이하 DVPP)를 성공적으로 진행시키기 위하여, 어느 프로젝트에나 실제로 적용할 수 있는 CCS 비즈니스 모델을 개발하고 이를 여타 프로젝트와 공유하기 위하여 글로벌CCS연구소와 공동으로 본 보고서를 작성하였다. 2Co사는 전 세계 CCS를 위한 자체 개발 비즈니스 모델을 공유함으로써 CCS관련 기관의 구성원들이 사용할 수 있는 실용적인 정보를 제공하고자 한다. Presentation held by Jane Paxman on 2CO at A Year of Knowledge Sharing: Sowing the first seeds 10 May 2011 Rotterdam, The Netherlands.